THE earliest electrical phenomena known to manâ€”outside of such natural manifestations as those present in lightning and the lodestoneâ€”was the observation of the fact that a briskly rubbed piece of amber would attract to itself fragments of light material, such as cloth and paper. When the science of electricity developed further, the principle of electromagnetism took its place in the household in such familiar instruments as the door bell and the telephone. 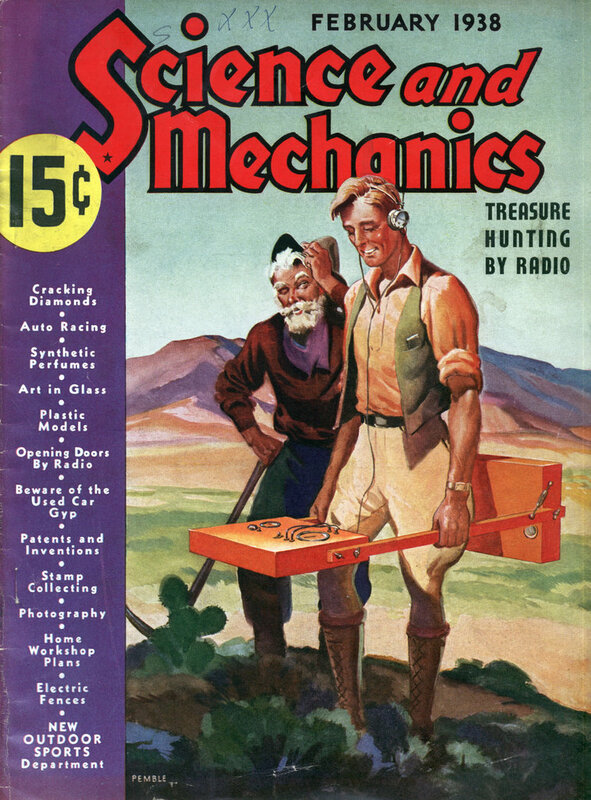 Brightly colored magnets of horseshoe shape also became familiar toys to the children. The use of the electromagnet in industry, for handling sorting and purifying materials is of comparatively recent origin. It has been given strong impetus recently by the development of a new alloy with superior electromagnetic properties. The new alloy, known as alnico, is especially useful for permanent magnets and in such form will lift sixty times its own weight. It will, it is expected, replace the electromagnet in such applications as fields for small motors. Electromagnets, of course, depend for their efficiency on applied current. The horseshoe magnet above described is an example of the permanent magnet; the coils in the doorbell an example of the electromagnet. The former will lose its magnetic properties after a time, and alnico, it is claimed, reduces this loss materially over metals heretofore used for permanent magnets. The electromagnet on the other hand, retains its magnetic properties so long as the current is applied. Since, in industrial uses, it is necessary that the magnet not only attract materials, but that it be so devised as to release them when necessary, applications in material handling and sorting are almost entirely of the electromagnetic variety. Obviously, there would be no point in lifting, let us say, a stack of railroad rails with a magnet, if there were no way to remove them except by pulling them away forcibly. Huge electromagnets easily lift tons of such rails and, attached to cranes, remove them to the desired location, where only the shutting off of the current is necessary to deposit them. In such material handling, the applications of the electromagnet are endless in variety. Some are large enough to have a capacity of 65,000 pounds, thus handling loads that would be difficult to move by any other means. 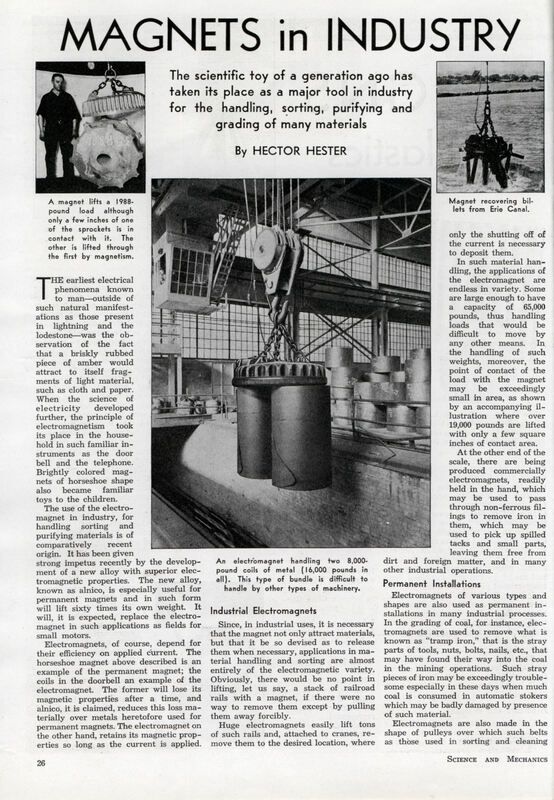 In the handling of such weights, moreover, the point of contact of the load with the magnet may be exceedingly small in area, as shown by an accompanying illustration where over 19,000 pounds are lifted with only a few square inches of contact area. At the other end of the scale, there are being produced commercially electromagnets, readily held in the hand, which may be used to pass through non-ferrous filings to remove iron in them, which may be used to pick up spilled tacks and small parts, leaving them free from dirt and foreign matter, and in many other industrial operations. Electromagnets of various types and shapes are also used as permanent installations in many industrial processes. In the grading of coal, for instance, electromagnets are used to remove what is known as “tramp iron,” that is the stray parts of tools, nuts, bolts, nails, etc., that may have found their way into the coal in the mining operations. Such stray pieces of iron may be exceedingly troublesome especially in these days when much coal is consumed in automatic stokers which may be badly damaged by presence of such material. Electromagnets are also made in the shape of pulleys over which such belts as those used in sorting and cleaning grain are run. The electromagnetic pulley, at the end of the belt, picks up whatever iron may be in the grain. The grain pours over the pulley into the bins, but the iron adheres to the belt until it has passed around the pulley when it is released and drops into some sort of collecting receptable. This operation is especially necessary where mixtures are made into animal feed because metal remaining in the mixture may damage animals. There are court cases of record where feed manufacturers have had to pay heavily because of foreign matter present in their products. In grinding and pulverising machinery, foreign metal causes another hazard. Not only may it damage seriously expensive grinding rolls in such machinery as flour mills, but striking against these rolls, it may set a spark and cause a serious explosion. Hence the use of electromagnets to remove foreign metals from grain or other materials going to grinders and pulverizers is fast becoming standard. Magnetized rolls are also coming into great use in production lines. Flat rolls, geared to power motors, are used for moving steel and iron plates along finishing and inspection lines and are often so canted as to move the sheets up an incline. Similar rolls, properly grooved, are used to move pipe through cleaning and threading and cutting operations. Sometimes the pipe is moved along over magnetized rolls, again it is suspended by magnetism under them. In the reducing of large, bulky scrap items, such as worn out automobiles, to scrap bales of pieces of handleable dimensions, heavy iron balls, called “skull crackers” and weighing six tons and more are used. These are raised to the desired height above the bulky scrap by an electromagnet, and then dropped on the mass repeatedly, until it is broken and smashed. There are also electromagnetic pots through which solutions for the making of fine glass ware and porcelain are poured and which will remove from those liquids the oxides that would otherwise cause defects in the finished product. Electromagnets not only still play a large role in scientific study and research, but that role is becoming more and more important every day. They are finding a place in art, too, and the modern pipe organ artist finds his operation of organ stops in combination much simplified because the electromagnet has been given the job to do for him. A new use of magnets is a gadget, used by beauty shops, for removing hair pins after waves are set. Its amazing how useful magnets are to us people have been using them for years any thing from decorative to lifting heavy products. I am sure that they will still be around for some time to come they truly a useful source.